Home NEWS	Motivation comes from him, not with-in! HAVE you heard the expression, “motivation comes from within”? Well, sometimes training with a friend or partner can mean the motivation comes from training with him. Statistics show 60% of people stop using their gym membership after the first month. Having a training partner can add focus and motivation, it makes it fun and helps get results. Some days it’s hard to find the will to train; whether it’s too many work or life commitments, too tired or just can’t be bothered. These are the reasons why gym memberships can fail. If you have a training partner, chances are if you’re not feeling like training, they will and they’ll pull you along. You’re committed to them and committed to the process. It works. At the end of a session, I’ve heard these phrases many times; “I didn’t feel like coming, but now I feel great”, “the hardest part of the workout is just getting there” and another cliché is true – “you never regret a workout”. 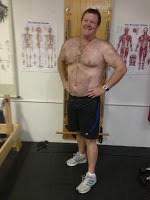 I have a client, Wayne, who came to me very overweight and unhealthy. Wayne (pictured before and after) has lost over 26kgs and says his mates saved his life. He trains with three mates and said to me recently their sessions have become “more like a social event which none of them want to miss”. I was unaware but in between sessions, phone calls were being made between them and as a result they kept each other on track, motivated and “into it”. They’ve kept it fun and the end result is they’re all getting super healthy and loving it. Another client, Tracey, trains with her husband Murray who has lost over 30kgs. They view training as their “date night”. They get a babysitter to look after their toddler and see their sessions as a chance to have a laugh and enjoy each other’s company while working out. It works! Her motivation comes from him. Another massive motivational factor is fun and training with your friend or partner will help to make it fun. I give my clients a diary and part of our process is planning their exercise for the week on a daily basis. The gym work, twice a week, merely supplements and enhances the enjoyment of the outdoor activities and life in general. The trick with the outdoor activities is simple, “make it fun and it will happen”. Make it an event which you look forward to; a run across the Sea Cliff Bridge, a walk along the Wadi Wadi track or a roller blade to Wollongong. Make it fun and make it a regular thing and pretty soon you’ve got a healthy pattern developing – you’re having fun and you’re getting healthy.